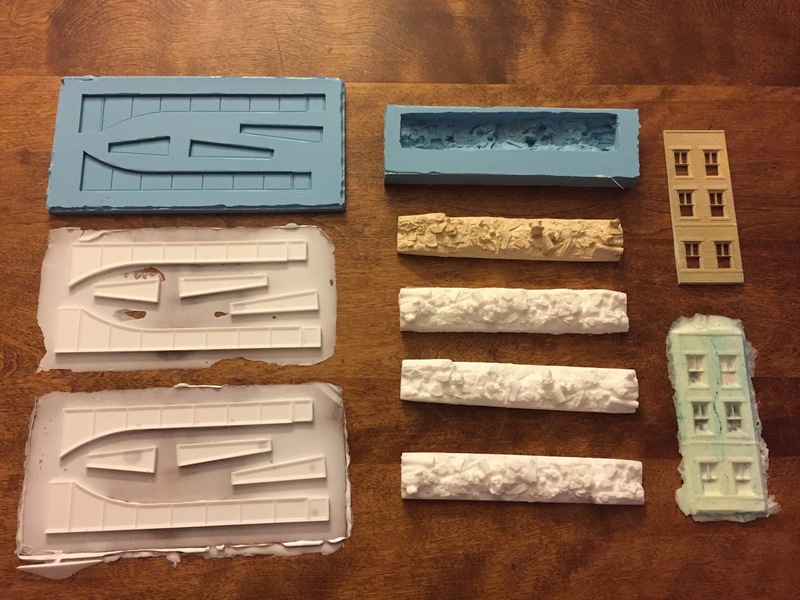 Modeling Monday: Route 15 Overpass - Castings Reveal! So, as things typically happen lately, I got distracted by work/life and am only just now getting around to sharing the result of the castings I poured over a week ago. And this time, I actually had enough room on my iPhone to shoot a proper video. Well - I don't know how "proper" but at least it didn't get cut off this time. . . I'll never become a YouTuber, but let me know if you've been enjoying the videos and/or finding them helpful. If a picture is worth a thousand words, a video's gotta be worth even more. And it saves a lot of typing :^) And - bonus! - you actually get to see in kinda-real-time how things are working (or not - that's the joy of a "live" video). 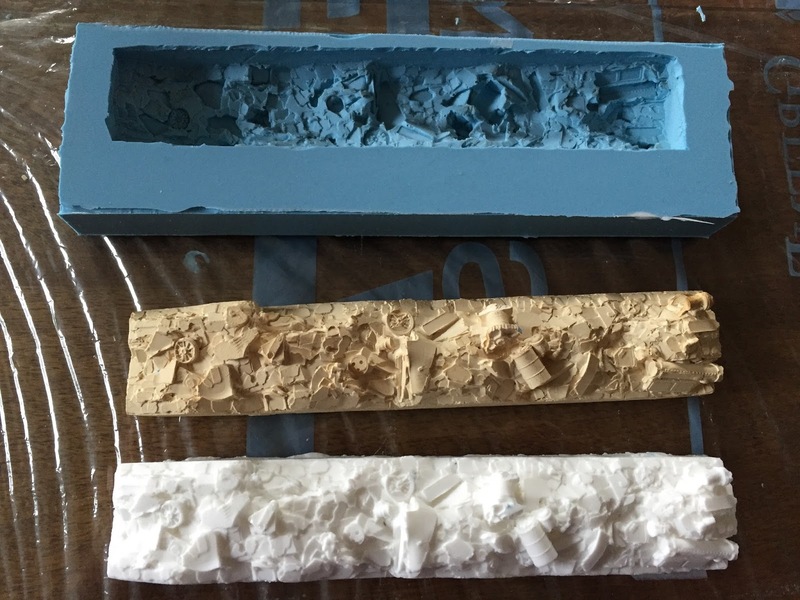 But this is a blog after all, so here are some detail shots of the castings that I got. I don't know if I had beginner's luck or not, but I think they came out really well. Remember that beginner's luck I mentioned? Well, it wore off a bit with the second pour I did. My main mistake here was not overfilling the mold with the resin pour. As a result a lot of air - and thus, bubbles - got trapped under the acetate. Even WORSE - I tried to fix things by lifting the acetate up and smoothing the bubbles out. Big Mistake - that really just made things worse and created more bubbles. I would have been better off just placing the acetate,leaving it alone, and seeing what I ended up with, come what may. Note to self: Always overfill the mold. The beginner's luck didn't totally leave though, cuz the castings ended up ok. Yeah, there are a lot of voids, but they're either on the back (where they won't be seen) or actually in the casting (where they really won't be seen - especially after they're painted). So, as I mentioned on the video, turns out I really only need two sets of girders in addition to the masters in order to have enough for the Rt. 15 overpass. But for that plan to work, I needed to be able to free the masters . . . If you can remember waaaaay back when I first started this a couple weeks ago, I mentioned that I used some Aileen's to glue the masters onto the base of the foamcore box. Well, while it did take a bit more time than I expected, a soak in water did eventually allow me to carefully peel them off. And there wasn't even any residue! Certainly no damage to the masters, which of course is awesome. I'll be sure to wash all the pieces thoroughly before painting though. And that's it! At least for now, my resin casting efforts are going to take a back seat while I focus on some other things. Busy days at work will be ending in a few weeks and I've been immersed in shopping for a new car (mine just turned 180k and the Missus' car just turn 245k!). Unfortunately, my FIL is still in the hospital, but doing ok all things considered. It's just a long road. Thanks for your continued thoughts and prayers. Thanks to all of you that attended the NMRA Nutmeg Division meeting yesterday and hung around for my presentation on Operating the Valley Line. You were a great audience and I got some good feedback that'll help me improve it for the upcoming NEPROTO Meet. Hope to see you there! Not too bad - but I still got some seepage of rubber underneath the masters, despite running a bead of glue around the perimeter of each part. Next time, I'll make sure that the glue seeps out just a little around the edges - that should seal things nicely. But that's next time. For now, I had some trimming to do. And, after trying even a sharp x-acto, I came up with the perfect solution - sprue nippers! As you can see above, they're straight and flush-cut ting. Just what I needed to go around trim off the extra rubber "flash." Compare this photo with the "before" shot above, and I think you'll agree that the nippers worked great. Next step was to mix and pour the resin. Click here for the details. As before, I mixed the Parts A & B in equal measures together, then slowly poured into the mold doing my best to avoid bubbles. And - important (as I discovered later) - be sure to "overfill" the mold slightly. Next, cover with acetate or plate glass/plexiglass to keep the backs of the castings flat. As you can see, a few bubbles resulted. I'm not sure yet how to avoid that and decided they didn't matter since they'd be on the back of the castings anyway. Lastly, weigh it all down. I think that'll help a bit with the bubbles but we'll see. It turned out that I ended up mixing a bit more resin than I needed and it had actually started to cure ever so slightly in the mixing cup. 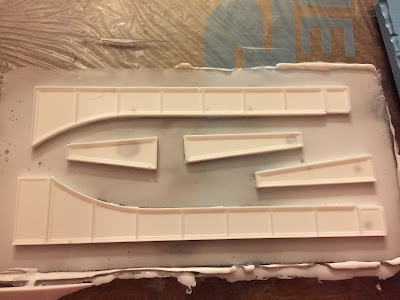 So I did an experiment and quickly poured the rest of it all into the gondola load mold I'd made before. Just a quick & dirty pour - and I didn't even bother with acetate or a weight. And this is what you end up with (above). A very non-flat surface that's not only very uneven, but slightly humped. No matter though. Because: test. This comparison shows you the difference the acetate/weight will make. 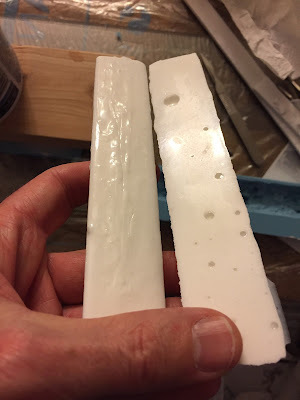 Sure, the casting on the left has no bubble voids, but the casting on the right doesn't require lots of sanding to get everything flat and flush (though you may want to putty the holes - not really necessary on a gondola load). So now I'll wait overnight to see how my *important* (i.e. "not test") castings come out. Since I've done a bit of practice, I've become much less intimidated by the whole casting process. At least I've cleared a lot of the fog for myself and removed some of the mystery. 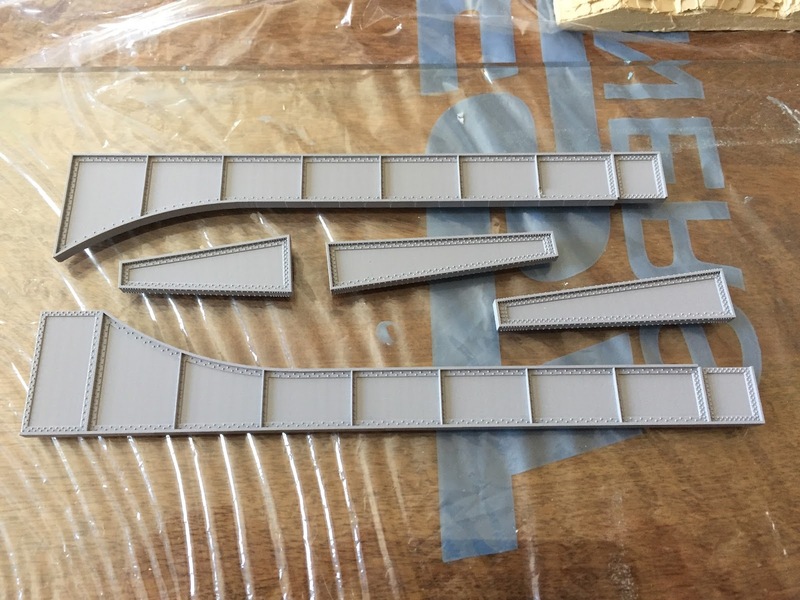 Hopefully that bodes well for what I hope will be some really nice girder pieces for the Rt. 15 overpass in Wethersfield. Since things have been so busy lately, and despite all the necessary extra driving, I am way behind on one of my favorite ways to pass the time - listening to model railroad podcasts. In fact, I'm SO far behind that I just recently realized that my convo with Lionel Strang at Springfield got posted (over a month ago - yikes!). Lionel hosts one of my favorite podcasts - A Modeler's Life - and he and I spent some time together during the Big E train show weekend talking about trains. So check it out if you can - link is here and just scroll down to March 9. Unfortunately, unlike my other interviews, it's on the paid Patreon site. But browse around there and see if you don't agree that you can get a lot of great content for as little as five bucks per month. And whether or not you head over to Patreon, be sure to check out the free content on the ol'AML. Lots of great stuff there - or at least something to make long commutes a little more bearable! 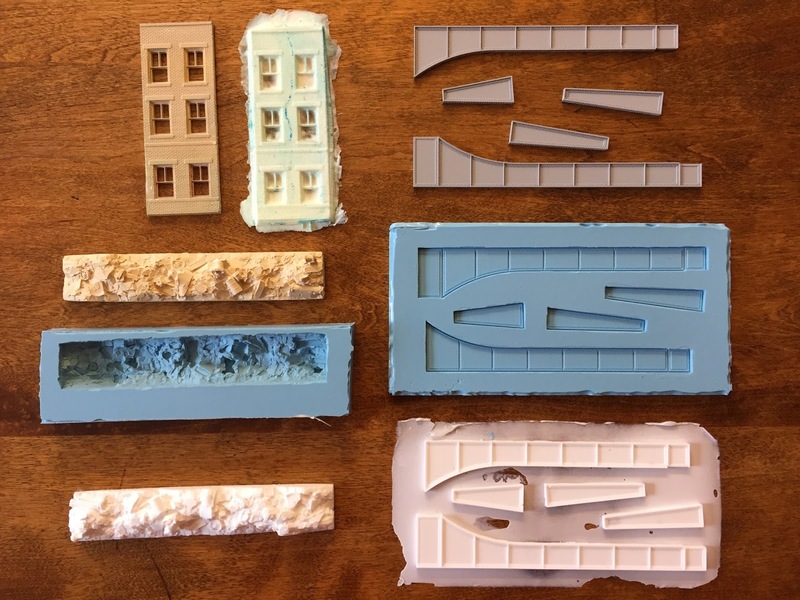 I mentioned last time that the main reason I wanted to learn how to do resin casting was so that I could duplicate the wonderfully-detailed bridge girders that Mike Redden made for me from photos I took of the Route 15 overpass. This overpass will anchor the north end of the Wethersfield scene and provide a nice - and prototypical - view block for hiding where trains head "to Hartford." Well, after doing a test run using an old scrap load as a master (click here, here, and here for details on the steps involved), I decided it was finally time to tackle the overpass. I started with Mike's Shapeways parts as masters, which I'd primed last October(!). Here I'm trying to arrange them as efficiently as possible for the mold. I determined that about 8.5" across and 4.5" front to back would make a good footprint/base. So I measured that all out on a piece of foamcore, cut out the base and then cut the sides at about 5/8" high. This would account for the thickness of the base (I glued the sides to the edges of the base rather than on top as I did before), the thickness of the parts, and still allow a 1/8-1/4" of rubber on top to cover everything adequately. In addition to hot gluing the sides to the edge of the base and to each other, I also ran a bead of glue inside each joint to ensure that the box was water rubber tight. Next, instead of using hot glue, I decided to use quick drying Aleen's Tacky Glue to attach the parts to the base of the box. 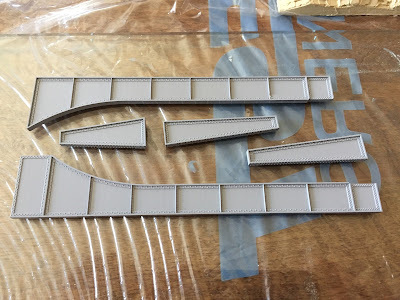 To (try and) ensure that no rubber would seep underneath the parts, I ran a bead of glue around the entire perimeter of each part to, hopefully, form a nice seal/barrier. I'm not too concerned about messing up the nice masters, since the Aleen's should just soak off with water. I guess we'll see. Pour the rubber into the mold from high up (12" +/-) if possible so you have a small, thin stream (again, to reduce bubbles), starting in one corner and covering the entire master. If you aren't comfortable pouring from that high - or if you can't maintain a steady stream - you can pour closer, just keep it flowing so as to reduce bubbles. I set up my iPhone on a tripod and got a Bluetooth shutter release so I could take hands-free pictures during the process. 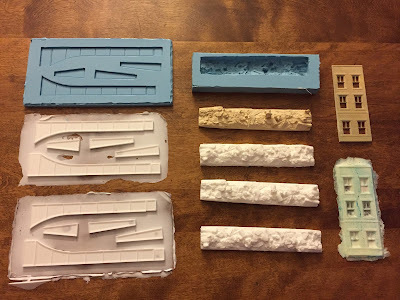 Here's the rubber mold material from the Micro-Mark resin casting starter set. Put some of Part A in one cup and an equal amount of Part B in another cup. Then mix the two cups of material together in a third, clear cup. Be sure to scrape out all the material from each cup. Then mix the two parts by slowly stirring them together. The clear cup helps you see how thoroughly you're mixing. When it gets all thoroughly mixed together, you're ready to pour. Well, almost. Set the cup down and tap on the sides for a minute or so to encourage any bubbles to surface so they'll pop. Then pour. This step is both the most fun - since it's cool to see it coming out of the cup and into the mold box - but also the most harrowing - since you're covering up, in this case, over $40 worth of parts with liquid rubber. Start in one corner . . .
and work your way around . . .
and all throughout the mold box, covering everything with hopefully enough material. You can see that I had extra cups waiting on standby in case I had to mix up more rubber quickly! You have about 7 minutes from mixing to pouring. Use your stirrer to scrape out all the material - might as well be sure and use it all up! The final step, like with the rubber in the cup, is to tap on either side of the mold box to encourage the bubbles to surface. And just because I have this handy-dandy camera & shutter release setup, I decided to do a video of this complicated process . . . Tapping releases the bubbles and blowing across the surface helps them pop faster. And here's what you end up with with your done - a nice, smooth swath of rubber. Whether it made a good mold or not remains to be seen. Until next time . . . So here's where we left off last time - resin poured into the rubber mold & a sheet of acetate laid on top and weighted down . . . The video from last time seemed to work well, so instead of a lot of pictures and text, I figured I'd do a longer video of "unmolding" the casting . . .
As I mentioned, I'm not happy with the bubble-voids, but they're on the bottom of the casting where they won't be seen, so they don't really matter. I'm just happy that all turned out as well as I'd hoped. Not bad for my first rubber mold/resin casting effort. Here you see the mold I made, with the master in the center, and my copy/casting on the bottom. Now, all this was by way of practice for the real reason I got all this casting material and did all this practice in the first place. I intend to use the Shapeways parts that MikeR made of the Rt. 15 overpass and use them as masters for a bunch of additional girders so I can, yes, FINALLY(!) make some more progress on the north end of Wethersfield! PS: be sure to let me know what you think of the videos. I'll never become a Vlogger, but sometimes I think having a video in a post instead of a lot of pics and text description is more helpful. So let me know your thoughts in the comments! 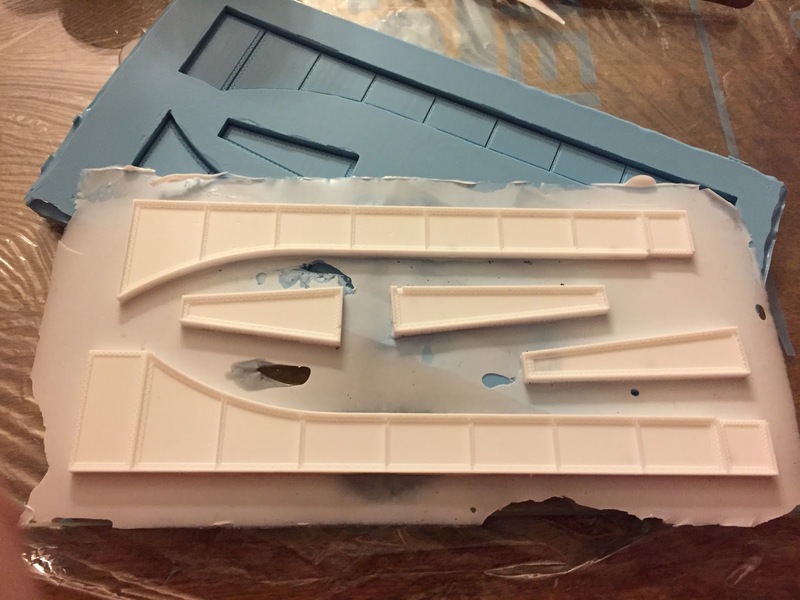 So when we last left the mold-making process, I had just poured the rubber into the mold box and used a Rube Goldberg-like setup to hold everything in place (thanks DandHColonieMain for the observation). Click here to see that (and the rest of the previous steps). You can see in the pic above how 1) I didn't have quite enough rubber to cover the master, and 2) how part of the master poked up as a result. This was actually a blessing in disguise since it gave me a point on which to place the weight to keep the master from floating (yes, floating) up through the rubber as it cured. Next step is to remove the foamcore box, which is a simple matter of just peeling it away. But if a picture is worth a thousand words, how much would a video be worth? Sorry it got cut off (phone ran out of space), but you get the idea. Once I got the master out, this is what I was left with. Some trimming to do. And, flipping it back over, you can see where I didn't have quite enough rubber to cover everything. I'll just put a piece of packing tape over the hole to keep resin from leaking through when I do the resin pour. 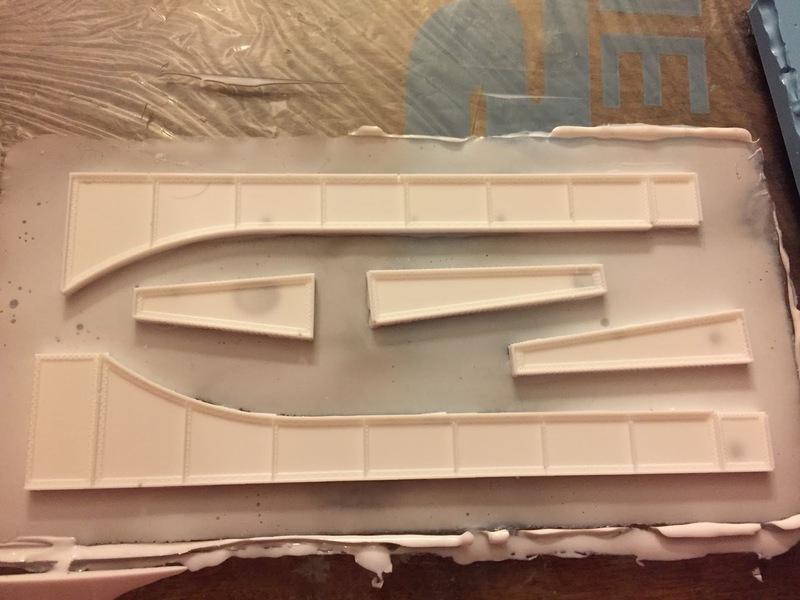 But, all in all, I'm really happy with how the mold came out - especially for my first time! I just needed to finish trimming where the rubber had seeped under the master. Trimming was easy with a new x-acto blade - and here's how it looked when all that trimming was done. 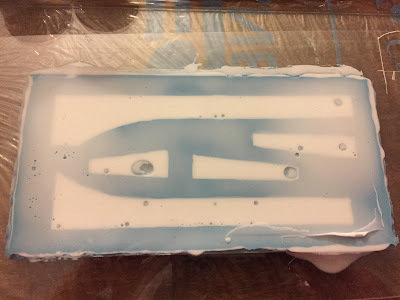 Put on some rubber gloves and make sure you have a nice, level spot on which to place the mold (of course, cover the spot with plastic or - as I did - use a piece of plate glass - to keep any resin from going where you don't want it to). Gently shake the two bottles of resin - parts A & B - to mix the contents. Pour equal parts of A & B into two separate cups. Pour the two cups together into a larger, clear cup & stir gently and slowly to mix the two parts together. Here, the resin is mixed together and the mold is standing by. I'm waiting a few minutes for bubbles to make their way to the surface. You have about 7 minutes working time from mix to pouring. Like with the rubber for the mold, pour a long, thin stream of resin into the mold to reduce bubbles. Work from one corner to the other, filling the entire mold. Overpour slightly so you're sure the entire mold is filled. You'll probably see some bubbles come up - I just blew on them and, when necessary, used a small brush to pop them. Next time, I may be a bit more aggressive with a toothpick. To ensure that the back of the casting is flat, place a piece of glass or acetate on top. You can see here that it squished out the resin a bit. The last time I did this, I used plastic wrap instead of acetate - but that resulted in a very wavy back. As a final step, I weighed down the acetate on the resin to make certain it'd lay - and stay - flat. Now I just need to wait for it to cure. The instructions say that it should cure in 15-20 minutes (you know it's cured when it turns from clear to white), but to be certain I just plan to leave it overnight. So far so good! I'll be interested to see how my first (well, technically, my second) casting comes out! The other day I happened to be home when I heard an engine from the local railroad ("local" as in "through my backyard" - literally) blowing for the grade crossing at my street. I'm ashamed to admit that, while this is still a relatively rare occurrence this far south, I didn't bother running down the street to see it. I thought it was just a light engine move - perhaps HOTT - but I was wrong. Turns out, the railroad was moving a "Washboard" - a former New Haven MU coach - down to the interchange for pickup. It would have made a pretty cool video, seeing it go over the crossing - especially since these cars ran only in the Electrified Zone between New Haven and NYC during the 1950s through the mid-1970s. I'll let others who are more knowledgeable on the West End weigh in with the particulars, but I think they were first delivered to the railroad around 1954 to replace multiple-unit electric coaches that had been around since at least the 1931 and earlier (some were still around from the 1909 delivery). I remember seeing them at Devon, CT around 1983, but I don't think they were in revenue service (IIRC, they were on a work/wire train). Unfortunately, I never rode in one. But it was cool seeing an original piece of New Haven equipment still in its original paint - including intact stainless steel letterboard. And having it go through my backyard and sit down at the interchange long enough for me to catch a few photos was a special - and very unexpected - treat. Here's wishing it a good future with a new owner that can restore it to its former glory. It was nice having it visit for a bit. P.S. This isn't the first time an electric has gone by here . . . I can't believe it's already been over 2 1/2 years since the EF-4 left the Valley Line. . .